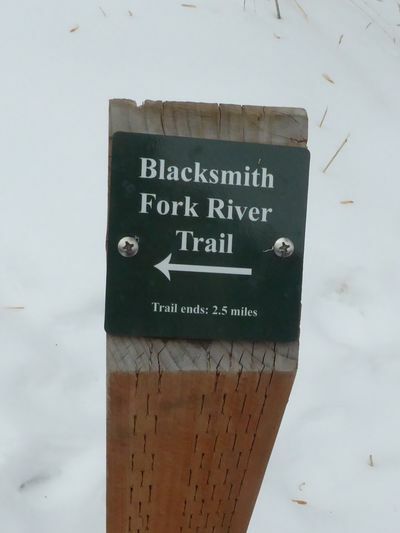 Some may wonder if gray skies and temperatures below freezing would discourage hikers from spending the day on the Blacksmith Fork Trail. 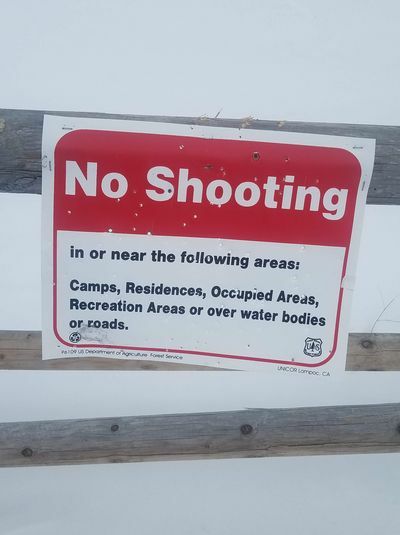 They would be wrong. 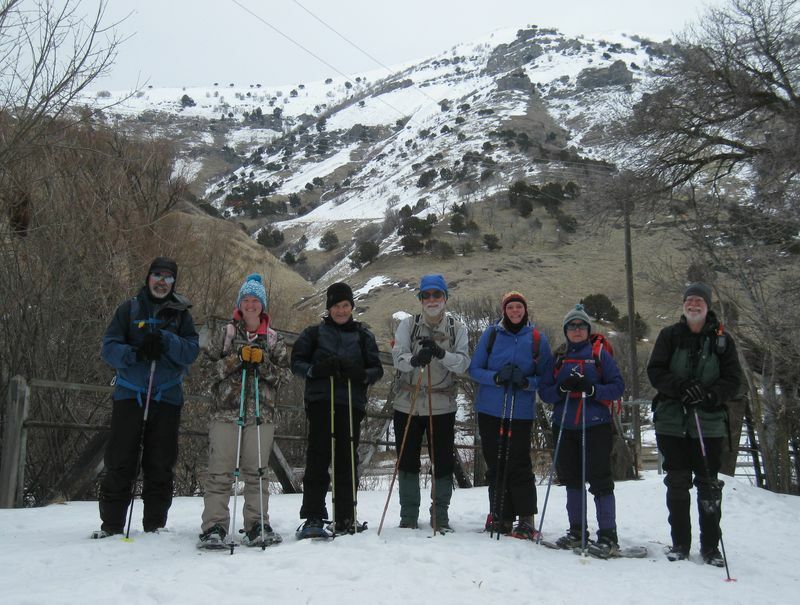 Eight enthusiastic hikers met for a winter walk that turned out to be quite enjoyable. 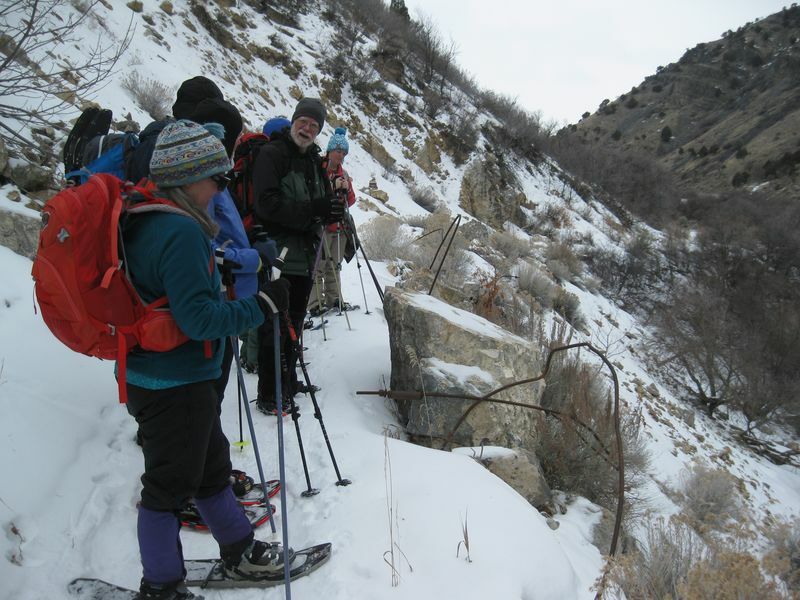 After carpooling from Logan to the trailhead just east of Hyrum, the group crossed Highway 101 and the Blacksmith Fork River where snowshoes or ice cleats were strapped on. The trail turned east as a two-track for 1/3 mile where a footbridge crossed the river at an old Civilian Conservation Corps camp. 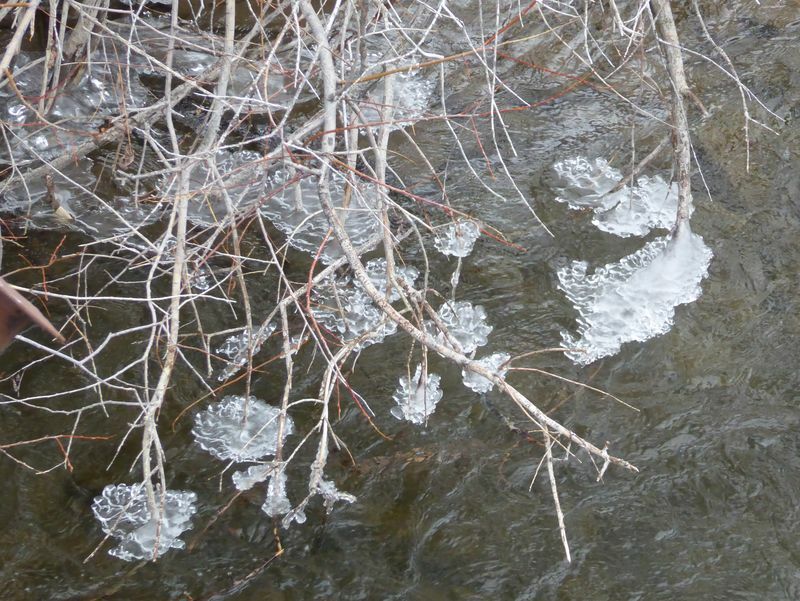 A 5-site campground with limited facilities here is reservable through Hyrum City. Through sagebrush and maple the trail continued along the south side of the river with snow thin or well-packed most of the way. 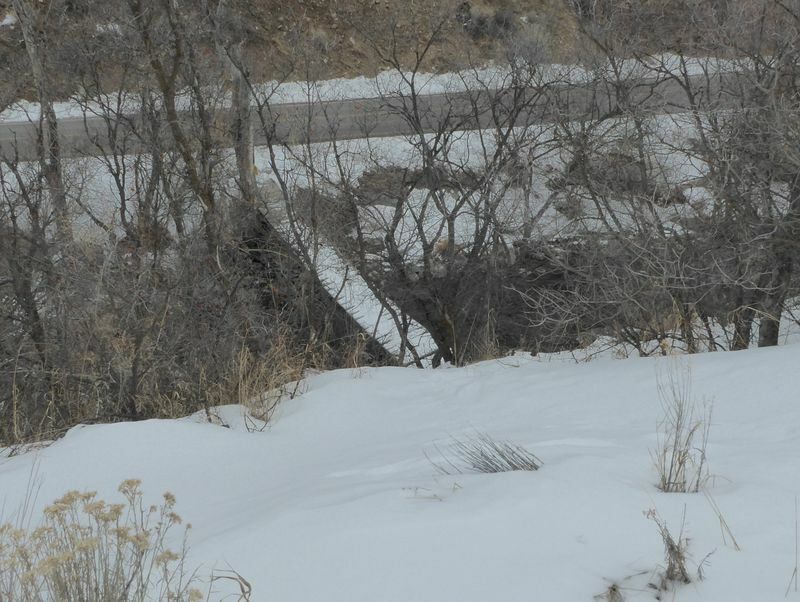 Before reaching the pole fence and boulders at 1.7 miles stops were made to observe deer, a raptor, an old wooden footbridge, shale and limestone formations, and the remains of the old wooden water pipe. 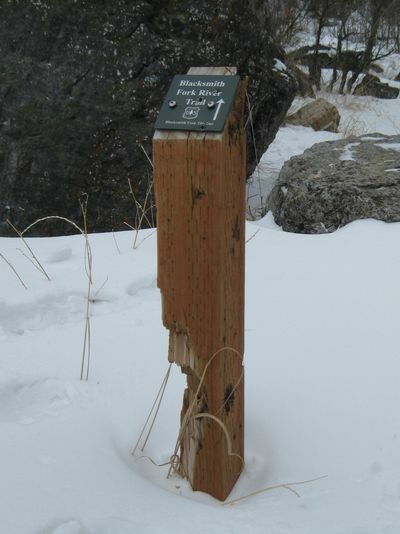 The trail was officially opened in October 2016 following the corridor created decades ago for this, now defunct, water pipe (now a more modern pipeline is buried under the trail)..
A bracing wind encouraged the group to continue past the huge boulders at the 1.7 mile marker (now significantly damaged by gunfire). 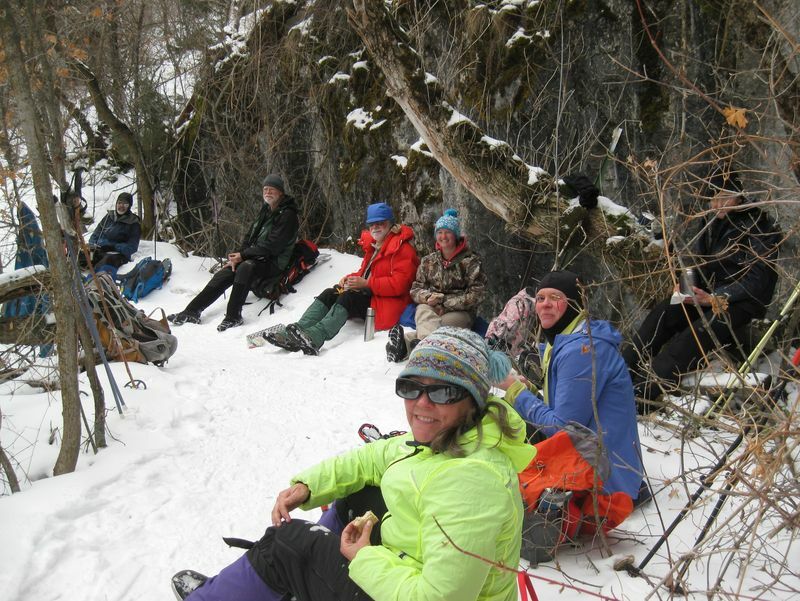 After a more sheltered walk to the end of the trail, a protected spot against a rock wall became the lunch spot. 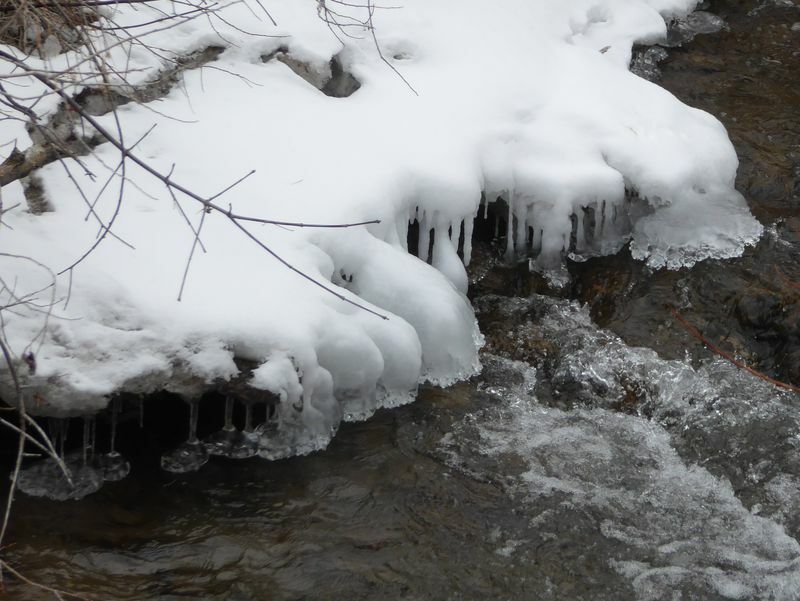 Clouds prevented the peekaboo views of the Wellsville Mountains on the return hike, but the cliffs and conifers lined with snow were beautiful and the rush of the icy river below provided a fine finish for this hike. Started hiking about 10:45 a.m. and returned to Logan about 2:20 p.m. 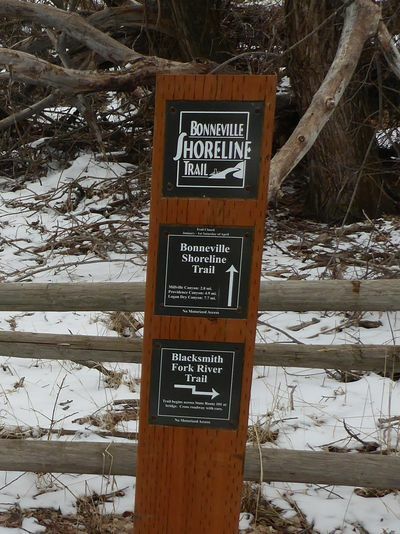 Thanks to Jane for the narrative and photos and Dave W. for photos and the GPS data.